The Tufts student judicial process can be a labyrinth of misinformation, fear, and intimidation for students and organizations that have been accused of wrongdoing. Now, after several years of false starts, the successful finalization of details with the University administration means the program will finally begin working toward its goal of protecting the rights of the accused this semester. It will ensure students are informed of their rights, including the right to representation. According to the TCUJ website, “The Student Judicial Process consists of mediation and arbitration, which includes disciplinary hearings, Tufts Community Union Judiciary (TCUJ) hearings, and Committee on Student Life (CSL) hearings.” For each of these processes one is currently entitled to the right of representation, yet the system is flawed because many students are unaware of these rights. Students do not know they can seek representation and often end up signing forms or speaking to a judicial affairs officer like Veronica Carter. Students, however, are not required to act as such and should abstain from talking or signing any forms until they have sought representation. The new program specifically addresses the issue of ensuring students understand their rights by providing students and organizations with a list of advocates trained in the student judicial process by the Dean of Students, CSL, or TCUJ to best suit the case at hand. The student can then contact these advocates directly to obtain representation for their particular case. The SOURCE believes this new system will not only assist countless students in understanding their rights, but will also protect organizations such as the Leonard Carmichael Society from being coerced into taking imprudent or unnecessary actions, as was the case last semester when a single activist almost put an end to the Tufts’ blood drives. The program is scheduled to go into effect in the coming weeks, following the completion of judicial advocate training. Until then, students involved in a student judicial process can seek out organizations such as the TCUJ for consultation. Upcoming publications aim to further inform students about the changes that are in the works. The OURCE is pleased that reforms are finally being enacted in this area. The semester began with the appearance of a new publication on campus, Cannon Magazine. The magazine is the product of an Ex-college course entitled “Making a Magazine, from Conception to Publication” and under the supervision of of Senior Boston Magazine writer Michael Blanding was designed to give students the opportunity to learn about magazine production. As Cannon senior editor Sarah Samuelson put it, “we all wanted to do something new and fresh, and learn the real nuts and bolts of journalism from a professional.” However, THE PRIMARY OURCE is skeptical that this was accomplished and believes students wishing to get involved with journalism on campus should do so by joining one of the student publications already available or establish one of their own. The need for a class where students take part in an activity that is already widely available makes no sense fiscally or otherwise. Unfortunately, looking at the finished Cannon product, it seems the class ignored a number of crucial journalistic principles. In order to produce a product that will command readership most people would agree that the timeliness of the publication and relevance of its content is important—yesterday’s news today doesn’t sell. Unfortunately, Cannon Magazine missed this mark by reporting on holiday shopping, pre-naked quad run activities, and other events that had already passed at the time of distribution. In fact, upon publication, one student was disappointed to find that she couldn’t purchase the “Wooden Incense Burner” featured in the magazine because the store it was listed for had gone out of business. The magazine claims to “stand alone in our campus’s array of publications as the only one that won’t bore you with politics and breaking news.” This is not only an insult to current student publications, but lends some insight to why John Kerry couldn’t mobilize the youth vote: they were too busy worrying about high fashion and booze. One of the most important factors in magazine production, as the OURCE is all too familiar with, is managing and effectively utilizing a limited budget. 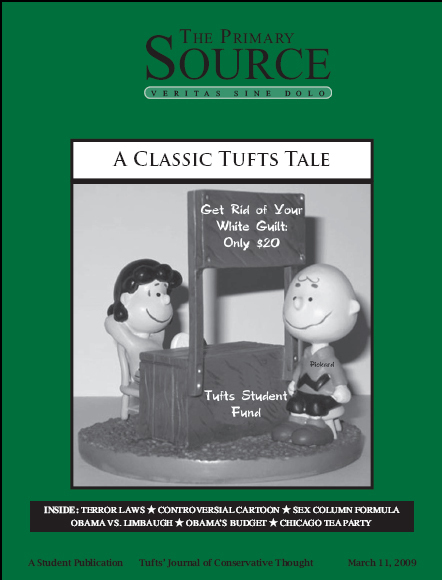 The cost of producing a magazine with the paper thickness and gloss used by Cannon is astronomical and could not be sustained at Tufts. It seems adhering to a fixed budget was not among the considerations Cannon editors were forced to contend with. In fact, when questioned, both a senior editor and the production coordinator were entirely unable to specify even a ballpark figure for the printing costs or circulation. Cannon’s executive editors promise, “[Cannon will] be as permanent a fixture on this campus as its monument namesake.” However, it is unclear how they plan to do this, considering the magazine is the project of a class that is not scheduled this semester. Senior Editor Sarah Samuelson says, “we would consider opening it up to the rest of campus and making it a real Tufts publication,” but given the staff’s poor familiarity with the financial aspects of journalism and printing, this is likely an unrealizable dream. Other issues, including the difficulty of dealing with libel accusations—of crucial concern in real journalism—arise out of the Cannon’s erratic production schedule and format. Exposure to journalism in practice is healthy, but the field isn’t all glory. Behind-the-scenes work like financial and legal considerations are as crucial to the success of a magazine as what ends up in the reader’s hands. Unfortunately it doesn’t seem like the enthusiastic staff of Cannon Magazine were made aware of this. Already infamous for stifling and arbitrary gun laws, California recently passed yet another nonsensical restriction on gun ownership. In late 2004, Governor Arnold Schwarzenegger signed a bill outlawing the manufacture, sale and possession of .50 caliber weapons. Anti-gun organizations such as the Violence Policy Center (VPC) claim that 50-caliber guns are destructive weapons of choice for criminals and terrorists. VPC analyst Tom Diaz painted ludicrous pictures of tanks of flammable liquids being shot from a distance to create explosions (incendiary ammunition is already illegal) and aircraft being shot during landing or takeoff (no matter what size bullet it shoots, a rifle is a useless anti-aircraft weapon). Diaz clearly has little familiarity with the guns in question and was composing hypothetical scenarios with no basis in reality to achieve maximum shock value. It is regrettable that people attempt to misinform in such a manner; it is outright deplorable that policy affecting a constitutional right is enacted based on such misinformation. What was ignored is the fact that the type of bullet used in most .50 caliber rifles has been available for almost a century, and has virtually never been used in crimes due to how cumbersome, conspicuous and expensive the associated rifles are. Such typical rifles cost around $10,000 and weigh 30 pounds, making them quite unsuitable for most purposes beyond collecting and competitive shooting. In fact, the .50 caliber round has an excellent safety record. However, having achieved victory in California, the VPC and its allies are pushing for similar bans in other states and a law requiring the government to keep the names of .50 caliber rifle owners on file. It is a dangerous precedent for a government to erode the rights of its citizens by punishing gun owners and accusing them of being terrorists, all based on imaginary crimes and the size of a particular bullet. Liberals have been throwing quite the hissy fit over President Bush’s inauguration. The less fanatical leftists got upset about the lavish and extravagant ceremony, and the Ted Kennedy branch is insinuating that the President values his victory celebration over both the safety of the men and women in the military and the well being of the Asian tsunami victims. Democratic Representative Weiner, for example, made the astute suggestion of re-directing the inauguration funds to Southeast Asia. Of course, the United States is already providing hundreds of millions of dollars from both government and private sources to the afflicted areas. Weiner also failed to mention the Commander-in-Chief Ball and the Military Gala, both highlights of the inauguration celebration, and both organized to benefit the soldiers and honor their bravery. The former was a new addition to the inauguration festivities and will be free of charge to thousands of members of the armed services who have recently returned from Iraq and Afghanistan or will be deployed there in the near future. Furthering adding to the hypocrisy of the Left, the price tag of Clinton’s second inauguration exceeded President Bush’s by 25 percent. This double standard from the Democrats should come as no surprise. As in the case of the 2000 Electoral College debate, liberals have shown willingness and skill to distort hot button issues to advance their own agendas, while remaining relatively unconcerned with either the validity or consistency of their own arguments. The electoral system of this country didn’t seem to bother the Democrats until it came into conflict with their power-hungry self-interest. The Democratic criticism of the inauguration celebration serves no purpose but to score some cheap political points. Only Democrats have the audacity to use America’s brave service men and women for their party’s political gain. The line between political rivalry and reckless political posturing has clearly been crossed.